Before G8 summit in Northern Ireland Alexander Yakovenko, Ambassador of Russia to UK, talks about international terrorism. Recent events in various regions of the world show that the threat of terrorism has not receded but acquired a new dimension. It is adapting to new realities, spreading to regions previously untouched. Terrorism crossed the borders long ago, it is fast-arming and it develops new funding sources. Al-Qaeda and the Taliban continue to generate terrorist threats, with a heavy reliance on drugs trafficking. Unfortunately, after the conflict in Libya, terrorism has spread to West Africa and the Sahel region. Old tribal rivalries together with the uncontrolled flow of weapons contributed greatly to terrorism and the spread of radical ideology. This is a threat to international peace and security that is hard to predict and address. International co-operation is crucial if this transborder challenge is to be dealt with effectively. Much has been done to create an efficient global response system, which includes a solid contractual base. In June 2012 the UN General Assembly recommitted the international community to the United Nations Global Counter-Terrorism Strategy, thus strengthening the resolve to support victims of terrorism everywhere and to adopt a comprehensive anti-terrorism approach based on respect for human rights and the rule of law. No counter-terrorism policy could be effective without addressing the conditions that are terrorism’s breeding ground. Development and security are critically linked as never before. The United Nations has the essential co-ordinating role in this process. We attach huge importance to the work of the UN Counter-Terrorism Committee and the “1267” and “1988” committees on, respectively, al-Qaeda and the Taliban. It is also critical to maintain a focus on sanctions and to prevent nuclear terrorism. 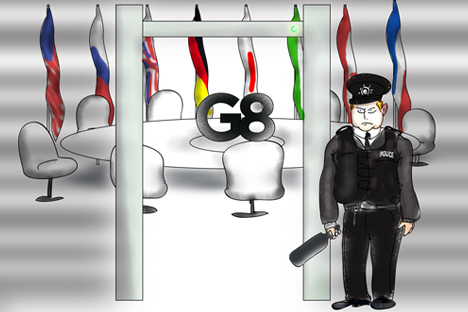 British Prime Minister David Cameron has repeatedly said that extremist and terrorist violence will be at the top of this year’s G8 summit agenda, which will be held in June in Northern Ireland. Citing the conflict in Mali and the terrorist attack in Algeria, Mr. Cameron said he believes that all G8 states are in the midst of a long struggle against murderous terrorists and a poisonous ideology that supports them. Russia supports this position of the British government. All the more so, given that, as President Vladimir Putin said, Russia is itself a victim of international terrorism, one of the earliest victims. The recent terrorist attack in Boston proved again that counter-terrorism also requires improved co-operation of law enforcement agencies on a bilateral basis. Timely exchange of information and appropriate reaction remains a priority for all states. Distrust, fed by pride, prejudices and instincts of the Pact era, should not stand in the way of interaction that helps save the lives of our citizens. This is precisely why it is so important that the leaders of Russia and Britain agreed to restore limited co-operation between our security services. For 50 years, starting with Dmitry Karakozov’s unsuccessful attempt to shoot Alexander II in 1866, Russia lived under the threat of domestic terrorism. It was just one of many factors, including the First World War, that brought the country down. In our time, all the processes have accelerated, leaving nobody the luxury of complacency and a wait-and-see attitude. The world is globalised and we are in it together. So success depends on the coherent and co-ordinated efforts of all countries. Alexander Yakovenko is Ambassador of the Russian Federation to the United Kingdom. He was previously Deputy Minister of Foreign Affairs of the Russian Federation.